Some of the fundamental determinants of a successful online store are your conversion rate, customer retention rate, etc. The average online shopper today is connected through multiple channels. Connecting to these shoppers at the right time on the right channel would make all the difference for a store. To be able to do that you should be following the customer’s journey throughout the shopping cycle, and it’s no simple effort. It drives what is known as experience-driven commerce, and it is dependent on your omnichannel strategies. In this article, we will see how you can offer WooCommerce omnichannel experience to your customers. We will also discuss some of the essential tools that you may find useful in the process. 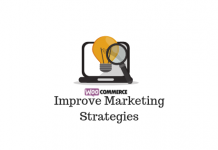 You will find a few WooCommerce solutions that will help you with a multichannel retail strategy here. Why Omnichannel strategies are important? Omnichannel strategies would help you stay on top of several stages of your sales funnel including the post purchase phase. How you are balancing focus on each different aspect would define your brand to an extent. When you have multiple sales channels you naturally have an advantage to acquire more customers. When you do a study to identify your target audience, you will be able to understand preferences over different sales channels. One you get a clear idea on the most profitable channels, you can focus more effectively on those. While focusing on multiple sales channels, it is important to synchronize all these to manage your inventory better. 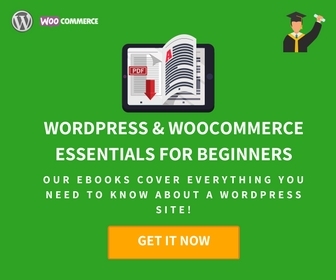 Thankfully, you will find several tools in the WordPress WooCommerce ecosystem that will help you manage multiple sales channels. Understand how to synchronize products and inventory from online and physical stores with WooCommerce POS solutions. Also, find the best inventory management tools for WooCommerce here. Your products getting featured on Google Shopping will improve the visibility of your products really well. With Google shopping, your products will appear on the Google search results page of your customers. It is a great way to acquire customers who are researching on products. Since they are already looking for your product (or one like yours), there are much better chances for conversion. The first step you need to take to list products on Google Shopping will be to create an account on Google Merchant Center and add a product feed. Google has several guidelines on how to create a product feed. Based on the Google guidelines, this plugin would create a product feed automatically by syncing your WooCommerce products. You can easily upload an XML file with the product feed to Google Merchant Center and then connect it to your AdWords account to create targeted ads. 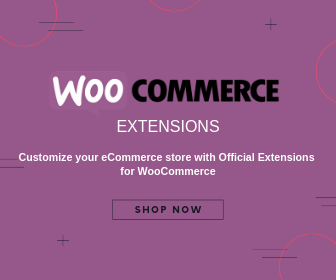 You will be able to add additional fields that are not part of your WooCommerce store as well. In addition, you can periodically update your product feed automatically with the help of cron job. The plugin would cost you $69 for a single site subscription. This plugin helps to create an XML file of Google Product Feed and helps you update it periodically. In order to create a successful omnichannel strategy, first you need to create awareness about all these channels that you are focusing on. Displaying social media buttons conspicuously on your site is one of the first things to do for this. A feasible strategy, tried by many stores, is to offer reward points for certain actions like reviewing your products, or liking your social media page. Here, we will look into a tool that can help you set up a reward system on your store. 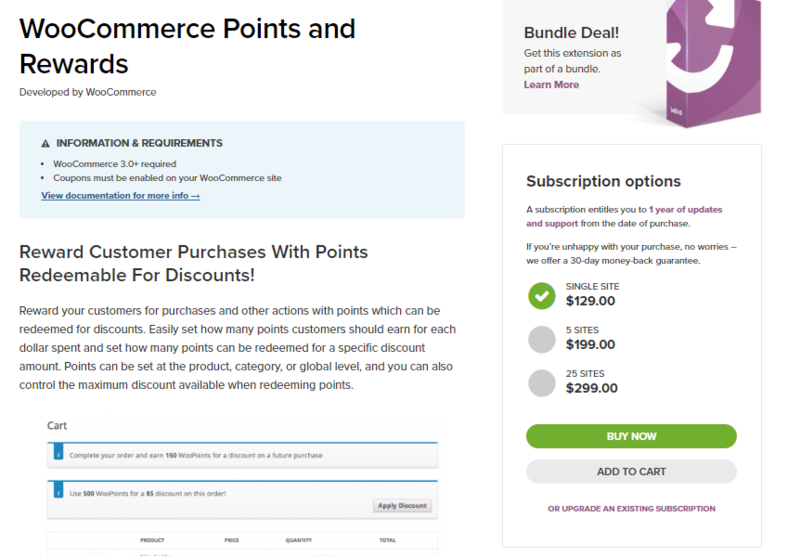 With the help of this plugin, you can maintain a point system on your store. Every time a customer completes a purchase, or perform one of the specified actions, you can allot a set of points. Once they accumulate a certain number of points, customers should be able to redeem points for discounts on the store. A reward system on your site can help a lot in maintaining continuous engagement with your customers. The plugin helps you define a distribution system for points based on customer actions. You will also have the control over how much discount can be applied while redeeming reward points. And every time customers use the points to redeem discounts, it will be auto-updated for them by the plugin. Customers can view the changes in their points from their respective My Account page. The single site subscription of the plugin is $129. The 5-site subscription is $199 and 25-site subscription is $299. According to a survey conducted by Aspect software, customer retention rate has increased by 91%, when omnichannel strategies were implemented. You can find a lot of similar scenarios, where simple improvements in serving customers can help with the overall shopping experience. Not being able to get the right support is a very important factor for a lot of customers. For example, when customers request for post sale support, they should be swiftly redirected to the correct department based on their purchase history. For this to happen, the purchase history of the customer needs to be synchronized with all your customer interaction channels. The contact point can be a physical helpdesk, live chat, social media channel, or the website support form. Naturally, if a customer can approach any of these channels based on their preference at a particular point of time, your omnichannel strategy is a winner. One of the basic requirements to make this approach successful is maintaining a good workflow on your customer support system. You can find some actionable insights to improve the workflow of your customer service department here. A good starting point for your omnichannel strategies would be offering a seamless support system for your customers. A superior helpdesk system with advanced features to provide a seamless experience to customers is what you need. 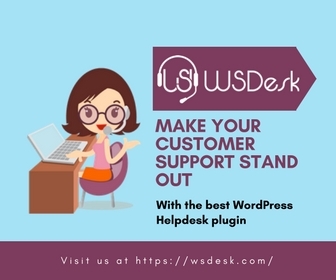 WSDesk is a popular WordPress helpdesk system, that will help you create a support system for your customers. With the help of this WordPress plugin, you can allow customers to create tickets for their queries. Even the emails that customers send to your specified support email would be changed to tickets. Furthermore, WSDesk offers a lot of automation options to assign tickets to the right agent, tag them, and to suggest solutions. Also, you can set triggers based on specified conditions for certain actions such as sending notifications to additional recipients. Features like ‘Agent Satisfaction Rating’, and ‘Canned Responses’ can help to improve customer experience on your store. Many online shoppers complain that they don’t get to experience the product before they purchase. This matters particularly when people are shopping for clothes, shoes, etc. Combining the conveniences of online shopping and a physical location, several popular brands opened ‘experience stores’ to tackle this. In such stores, customers can walk in and try out different clothes, and find out what they like. Once they are sure about what they want, they can simply use a kiosk to make a purchase online. Rest of the process will be same as any other online shopping experience. From a store owner’s perspective, this is much easier than opening a physical store that maintains a huge inventory. As the inventory management process is totally not a concern for these physical stores, there are more possibilities to provide better customer experience. Know more about the common customer experience challenges for a WooCommerce store owner, and ways to address them. At the same time, there will be a lot of customers who wouldn’t want to leave the comforts of their home. For them ordering online is just fine. However, you might have to set up a good returns and refunds process to manage their expectations too. Understand how to manage returns and refunds smoothly on your WooCommerce store. In some cases, offering store credits in place of refunds would help you reduce the loss in case of returns. When you are maintaining an online store, you have to ensure the best experience to all your customers. This will be possible only by thoroughly analyzing customers, their purchase behavior and interests. First and foremost you need to be available to customers at all the channels that they prefer to interact. 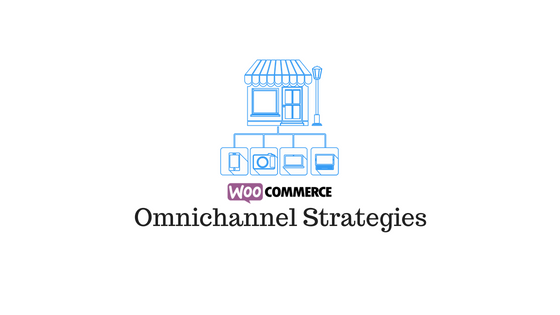 Let’s look at some of the fundamental aspects that will help you ensure a better WooCommerce omnichannel experience. This is something that you have to do regularly to ensure that you have a great idea on how customers are using your website as well as other channels. You can bring together different analytics insights of all your online channels. This would help a lot in understanding specific checkout flows, reasons for cart abandonment, etc. You have to also identify the value of customers in terms of incoming revenue. Your approach can be different based on various parameters like average order value, lifetime value, etc. Being able to differentiate between a new site user and a returning customer is especially important when you devise strategies. On a deeper level, you need to understand what role each of your channels play in bringing in customers. To be able to compare the value of each sales channel based on the number of customers as well as total revenue will give you a better perspective. This way, you will be able to understand the channel that is bringing you the most lucrative prospects. Now, we will discuss a popular tool that you can use to super charge analytics on your WooCommerce store. Metrilo offers you a great opportunity to create new sales by closely monitoring customer behavior as well as sales reports. As it is specifically designed for WooCommerce, it is pretty easy to get accurate and actionable insights. By simply looking at the dashboard, you can get real-time statistics that would enable you to understand customer behavior. You can also get customer satisfaction as well as retention rate to see how your store is performing. In addition, you can also understand how your top products are performing in terms of sales numbers. Metrilo also gives you detailed insights on how multiple sales channels are performing. You get an idea on the revenue trends from multiple campaigns, and focus accordingly for future efforts. It has three pre-defined funnels that will be monitoring your sales statistics from cart, product, as well as from content pages. This can be extremely helpful to identify any underlying problems in your sales funnels. The pre-set funnels of Metrilo helps you understand how your website is driving sales. Futhermore, it gives you accurate insights to target customers effectively. With the help of it, you can send personalized emails to customers to ensure improved conversions. You find some of the best WooCommerce CRM solutions here. Metrilo offers free trial for 14 days. After that you can opt for a pricing plan that starts from $119 per month. Start a free trial with Metrilo today! With an omnichannel strategy, you have to be available to customers wherever they want you to be. This can be a physical store, your website, or a social media channel. You will manage this only by relentlessly monitoring the customer data from all the different channels. Once you start deriving actionable insights from your analytics tools, you will be able to ensure a more experience-driven experience to customers. The results would be exceptional when you are able to utilize the full potential of omnichannel retail. Please leave a comment, if you would like to share with us an insight on the topic. How to utilize customer data for better conversions?